The United States intelligence and security apparatus is a vast collection of departments, agencies, and offices. It is not a single monolithic entity, although within it is a unified, decentralized group of 14 intelligence and security organizations known as the Intelligence Community (IC). The Intelligence Community is overseen by the director of the Central Intelligence Agency (CIA), the most well known of intelligence organizations in the United States, and includes the nation's most prominent law-enforcement organization, the Federal Bureau of Investigation (FBI), as well as many others. In addition to the Department of Defense (DOD), entities involved in national security include the departments of Justice, the Treasury, Homeland Security (DHS), Energy, Commerce, and Transportation. In terms of national security as a whole, departments such as Agriculture, Health and Human Services, and the Interior also have a role to play, as do independent agencies, including the Federal Emergency Management Agency (FEMA), the Environmental Protection Agency (EPA), General Services Administration (GSA), and General Accounting Office (GAO). Oversight of the IC in particular, and intelligence and security activities in general, comes from both the executive and legislative branches of government. The President, acting partly through the National Security Council (NSC), oversees intelligence and acts as commander-in-chief of the armed forces, a key component of security. Additionally, both houses of Congress exert influence through intelligence committees, and through their ultimate control over intelligence and security budgets. The power of Congress over intelligence and security is exerted at a greater remove than that of the president, whose Executive Office oversees the NSC and other functions. The NSC consists of the president, the vice president, and the secretaries of State and Defense. Leadership comes from the president, often acting with, or through, the Assistant to the President for National Security Affairs—a role better known by the informal title National Security Advisor. The NSC can and usually does involve other Cabinet-level departments with a stake in national security. In addition to the NSC, offices at the White House associated with intelligence and security include the Senior Director for Intelligence Programs; the National Coordinator for Security, Infrastructure Protection, and Counterterrorism; and the Office of National Drug Control Policy. Particularly critical is the President's Foreign Intelligence Advisory Board (PFIAB), which reviews the activities and performance of all agencies involved in intelligence and advises the president on its assessments. Under the aegis of the PFIAB is the three-member Intelligence Oversight Board, responsible for reviewing the legality and propriety of intelligence activities. Among agencies that operate at a national level are the Chemical and Biological Defense Information Analysis Center, Interagency Operational Security Support Staff, National Interagency Counterdrug Institute/National Interagency Civil-Military Institute, the Security Policy Board, and the Technical Support Working Group. Central to U.S. intelligence and security are the 14 members of the Intelligence Community (IC). In addition to the CIA, the IC includes 13 other agencies and organizations, of which most are part of DOD. DOD members of the IC include the Defense Intelligence Agency (DIA), National Security Agency (NSA), National Reconnaissance Office (NRO), National Imagery and Mapping Agency (NIMA), and the intelligence agencies of the Army, Navy, Air Force, and Marine Corps. Non-DOD members include the FBI (a part of the Justice Department), the United States Coast Guard (part of DHS as of 2003), the State Department's Bureau of Intelligence and Research, and the intelligence agencies of the Energy and Treasury departments. "customers," the IC produces and disseminates a variety of intelligence gathered through the four traditional methods of intelligence collection: human, signals, imagery, and measurement and signatures intelligence (HUMINT, SIGINT, IMINT, and MASINT respectively). Intelligence collection is directed toward information on international terrorist and narcotics trafficking activities, as well as other hostile activities against the United States by foreign powers, organizations, persons, and/or their agents. Other areas of interest for the IC, and for the intelligence and security apparatus as a whole, include information on cyber warfare, threats to critical infrastructure, weapons of mass destruction, and international organized crime. Members of the IC are also, of course, involved in the conduct of "special activities," to use the IC term, which can and do involve covert action against entities deemed a threat to national security. CIA and DCI. The modern security and intelligence apparatus had its beginnings after World War II, specifically with the National Security Act of 1947, which created CIA, DOD, and the NSC. Today the head of the CIA, the Director of Central Intelligence (DCI), also serves as principal intelligence advisor to the president, as well as director of the IC. He is also responsible for presenting the president with the annual IC budget, which must win congressional approval. 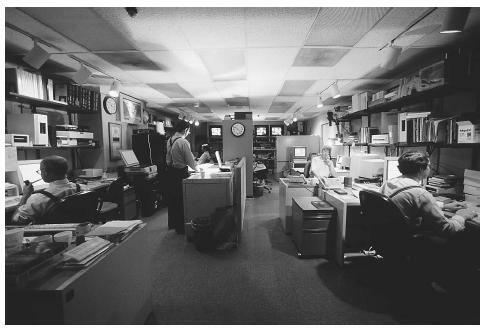 Staff organizations outside the CIA, but under DCI control, include the National Intelligence Council, responsible for preparing national intelligence estimates, and the Community Management Staff, which assists DCI in his IC executive functions. DCI also chairs two advisory boards, the National Foreign Intelligence Board and the Intelligence Community Executive Committee. The CIA is an independent government organization tasked with supporting the president, the NSC, and other members of the national security leadership by providing accurate, comprehensive, and timely foreign intelligence on national security topics. CIA also supports the Chief Executive and other officials by conducting counterintelligence operations, "special activities," and other duties relating to foreign intelligence and national security as directed by the president. The CIA includes four directorates: Operations, responsible for collecting foreign intelligence, including HUMINT, and for overseeing the overt collection of intelligence domestically through persons or organizations who volunteer that information; Intelligence, which produces the bulk of CIA's finished intelligence, processed from raw data collected in the field; Administration, which provides support to CIA activities through a number of administrative and technical offices; and Science and Technology, which also provides support, through research, development, acquisition, and operations of technical capabilities and systems. The vast Department of Defense, with its 3.2 million people (including active military, reservists, National Guard, and civilian personnel) includes several groups within the Intelligence Community, but a much greater portion of DOD lies outside the IC, with activities that fall under the heading of "security" rather than intelligence. Among the key DOD components of the IC is the ultra-secret NSA, the nation's leading cryptologic organization, whose activities include eavesdropping and surveillance. Within it is the even more secretive Special Collection Service. NIMA and NRO are likewise secretive and concerned with surveillance, primarily through satellites. In fact, NRO's existence was not even known until 1992. Unified commands and defense agencies. In addition to the services, DOD is divided into nine unified commands. Among the latter are five with geographic areas of responsibility, and four with non-geographic areas of focus. These are the Joint Forces Command, concerned with training and new solutions to future challenges; Strategic Command, which controls missile, deterrence, space, and satellite systems; Special Operations Command, which comprises a number of special support teams, including the Navy SEALs, Army Special Forces, and Delta Force; and the Transportation Command, responsible for moving personnel and materials around the world. DOD also includes 15 defense agencies, many of which are critical to national security. These include not only DIA, NIMA, and NSA, but also the Defense Security Service, Defense Security Cooperation Agency, Missile Defense Agency, Defense Advanced Research Projects Agency, Defense Information Systems Agency, and Missile Defense Agency. A number of components of CIA are concerned with counterintelligence, or the use of intelligence resources to identify, circumvent, and neutralize the intelligence activities of a foreign power. Likewise, the FBI has a major counterintelligence unit, the National Security Division. The FBI as a whole is concerned not just with federal law enforcement in the United States, but with intelligencegathering in the Western Hemisphere. In addition to the FBI, the Justice Department contains a number of other components involved with intelligence and security, among them the Drug Enforcement Administration (DEA), the National Drug Intelligence Center (NDIC), and the U.S. National Central Bureau, which coordinates with Interpol. As of 2003, Justice was also home to the Bureau of Alcohol, Tobacco, Firearms, and Explosives, formerly a part of Treasury. The latter department remains home to a number of agencies concerned with the security of financial assets, and with intelligence regarding financial activities. Treasury intelligence functions are a part of the IC. The Commerce Department, though it has no IC members, contains a number of organizations concerned with intelligence or security, most notable among them being the Critical Infrastructure Assurance Office. Among the State Department offices involved in the IC are the Bureau of Intelligence and Research, the Bureau for International Narcotics and Law Enforcement Affairs, the Office of the Coordinator for Counterterrorism, the Foreign Emergency Support Team, and the Bureau of Diplomatic Security. The Energy Department is inherently concerned with national security, inasmuch as it protects U.S. energy resources, and within it are intelligence components that belong to the IC. Most of these are part of the National Nuclear Security Administration, which is charged with protecting U.S. nuclear materials. The Transportation Department houses the Federal Aviation Administration, which has had a particularly important function in national security since the terrorist attacks of September 11, 2001. Transportation was also briefly home to the Transportation Security Administration, which oversees airport security screeners and air marshals, but those functions were moved to DHS. The latter includes a number of other agencies that formerly belonged to other departments, among them the U.S. Secret Service, Customs Service, Immigration and Naturalization Service, Border Patrol, and the Federal Law Enforcement Training Center. Independent agencies. Among independent agencies, GSA plays a role in the security of federal buildings, many thousands of which it manages. This role has been particularly critical since the terrorist bombings in Oklahoma City in April 1995. GAO studies the efficiency of U.S. activities and accounts for expenditures. It issues some 1,000 reports a year, and since September 2001, its evaluations of security measures undertaken by the federal government have provided a key means for assessing the degree to which various agencies and departments are prepared—or not prepared—for terrorist threats. FEMA and the EPA work with a number of agencies, including the Coast Guard, to respond to emergencies involving environmental hazards and similar threats. The United States has a number of entities concerned with emergency response, many of which work with state and local authorities. EPA and the Coast Guard co-chair the U.S. National Response Team, an interagency group charged with emergency response planning and coordination. In times of emergency involving threats to health, the Public Health Service is additionally a key component of the national response. Jeffreys-Jones, Rhodri. Cloak and Dollar: A History of American Secret Intelligence. New Haven, CT: Yale University Press, 2002. Johnson, Loch K. Secret Agencies: U.S. Intelligence in a Hostile World. New Haven, CT: Yale University Press, 1996. U.S. Intelligence and Security Agencies. Federation of American Scientists. < http://www.fas.org/irp/official.html > (April 29, 2003). U.S. Intelligence Community. < http://www.intelligence.gov/ > (April 14, 2003).